Amen & Goodbye hails the long-awaited return of Yeasayer—whether or not it is a triumphant return is a separate matter. On one hand, this is by far their most tightly put-together and cinematic release, but on the other hand, through the lengthy recording process, the enlisting of Joey Waronker as producer (all the other albums have been self-produced) and various other factors, Amen feels almost too polished. It lacks the distinctly explorative spontaneity of 2007’s All Hour Cymbals, only briefly or with some trepidation touches on the uniquely gyrating sounds of 2010’s Odd Blood, and invariably ends up sounding like a distilled—though not entirely disappointing—variation of 2012’s Fragrant World. As a standalone work, Amen & Goodbye is masterful, yet in relation to their other works, it seems like a small step where great leaps have been previously made. Through the sheen, some gems—intricate and captivating like only Yeasayer can be—do manage to shine through. The album opens with “Daughters of Cain,” a brief introduction to the religious tones Amen dances with and around for the remainder. It begins with a subtle piano vamping in the background, while a vocal/choral arrangement, similar to those often used by Queen, moves to swell and envelop the track. With eyes closed and mind willing, it stimulates lushly immaculate images for the listener—think steeples, cathedrals, choirs in flowing white robes. My favorite parts of Amen are the songs and moments that keep to this religious motif. Essentially, they are the innovations in this album—they are Yeasayer reaching out and beyond. 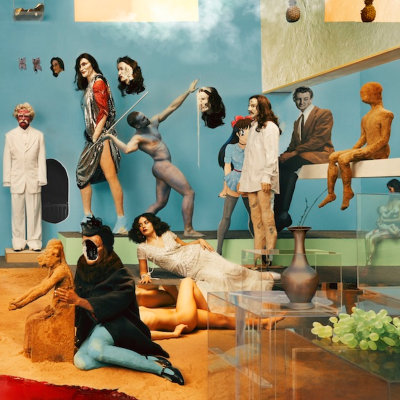 The first single, “I Am Chemistry,” is an example of Yeasayer skillfully combining new grandiose tones with the quirky synth sounds of “Ambling Alp” from Odd Blood and the gang vocals from All Hour’s “2080”—it is a song that can’t help but capture the uninitiated and adept alike. Featuring Suzzy Roche of The Roches, “Half Asleep” opens with sounds and textures reminiscent of a Hindu chant—deep, glowing, individualized—and evolves to sound more like a day in court during medieval times. It is a story of love wound around an ever-changing (and challenging) sonic landscape—simultaneously regal and jangly. A stripped-down number with an antiquated, wandering theremin (look up “Somewhere Over the Rainbow” played on the theremin) and brutally sincere lyrics, “Uma” is refreshingly beautiful in its simplicity and inherent honesty—one can’t help but admire a track that is so obviously the misfit yet manages to unite the other tracks. The album essentially closes with “Cold Night” (the final/title track is nothing more than a blip or two). “Cold Night” exhibits a roving and ambient background, guitars plucked seemingly directly from Death Cab for Cutie’s Kintsugi, and emotively charged lyrics like “Is there something I could have told you / To carry you through the cold night?”—thoroughly satisfying next to its negligible successor. One pivotal feature of this album is its cover art. David Altmejd has created an engaging cross between the covers of The Beatles’ Sgt. Pepper’s Lonely Hearts Club Band and Pink Floyd’s The Division Bell: mismatched, threatening statuesque figures, all seemingly with their own motives and problems, patiently wait against a blue-sky backdrop. It is a sublime and surreal manifestation of motion and stagnation, communication and ignorance.